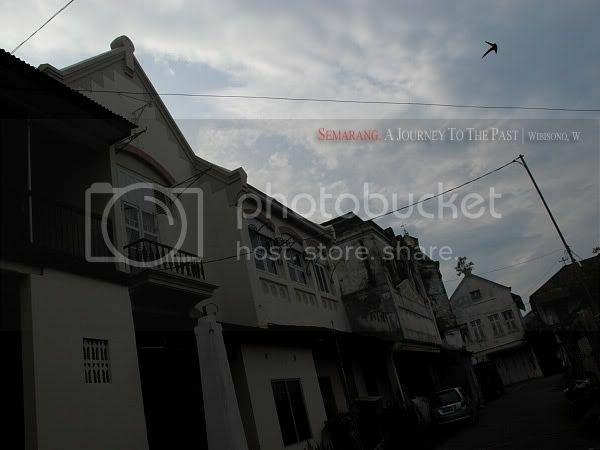 Some friends wondered why I would come back to Semarang over and over again just to take pictures and walk along the narrow streets of its old town. They said the city didn't have much to offer, especially to those who came with cameras (read: photographer wannabe). Maybe they were right. Everytime I came to the the old town, I always got stuck and ended up with shooting nothing. 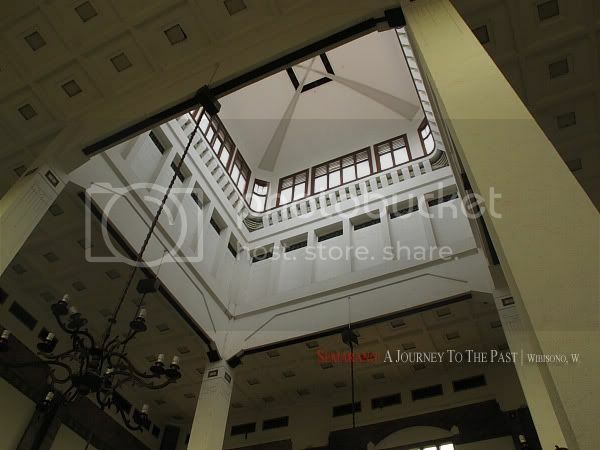 The only thing that kept calling me back to Semarang was its glory of the past as the city had once been a major port in the north coast of Java. Well, I didn't think traveling was always about taking pictures. It's also about exploring the place and getting to know the people living in it. So my two friends (Eli & Tia) and I had decided to wander in Semarang on the second day of our three-day-trip. What follows are the story of our short journey, trying to trace the legacy of the past. At around seven in the morning, we headed to the old town on foot. It was about 500 meters away from the hotel we stayed. This was the first time for my friend, Eli, to be there. At one corner, we splited up, tried to take different directions. I went straight to the west and they headed south. Well, I didn’t take much pictures, just some shots and then three of us met at Taman Srigunting (formerly known as Parade Plain, an old plaza next to Gereja Blenduk) before walking to Tawang Station for breakfast. We had to let Tia go to Demak by bus that she stopped in front of the station. She was going to visit her teacher that she hadn't seen for like twenty years. It was going to be a touching story to cover, but the time we had was so limited I had to choose to stay in Semarang. Having no idea what to capture at the old town was like the worst thing that could happen there. Eli and I wondered for a while what else to take with the camera. 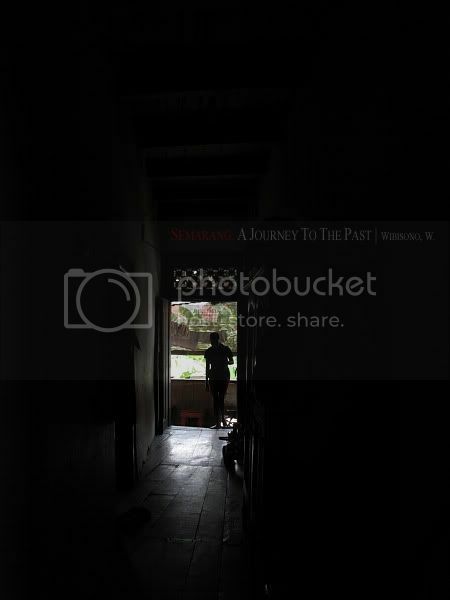 As we walked along Jalan Garuda, we got an idea of getting to know the people living in two old houses that from outside, looked like warehouses. We entered the first house and was not lucky as no one seemed to please with our coming. So we moved to the other one where there was a girl, about 17 years old I figured, sitting alone under a wooden stair that led to her home upstairs. She allowed us to climb the stairs to a balcony where we met an old man who was very kind as to welcome us. From the balcony, we went inside the house, walked along the dark corridor that bisected two large rooms. While wandering in the corridor, an old woman suddenly came out from one room and srcreamed at us. Not because she was mad at us. She screamed as if she had been excited with our coming to the house. Well, it was a weird welcome. She took us to the kitchen at the back before finally let us see the one big room that seemed to be a multi functioned one. There, she spent most of her time to cook, eat, listen to music, watch TV, and sleep. Oh I almost forgot to tell you their names. The woman’s name was Ibu Nining. She was born and raised in Cilacap and moved to Semarang in 1989 as she was married with Pak Sutriman, the old man we had met at the balcony. Pak Sutriman worked as a mechanic at one shop, repairing motorcycles. As for the girl, her name was Dessy. She had graduated from high school. The house itself belonged to Pak Sutriman's boss, a local Chinese guy who had lend it for ten years. Surprisingly, the family had occupied the house for nearly 23 years then. To me, traveling to someplace also meant riding its local transportation. 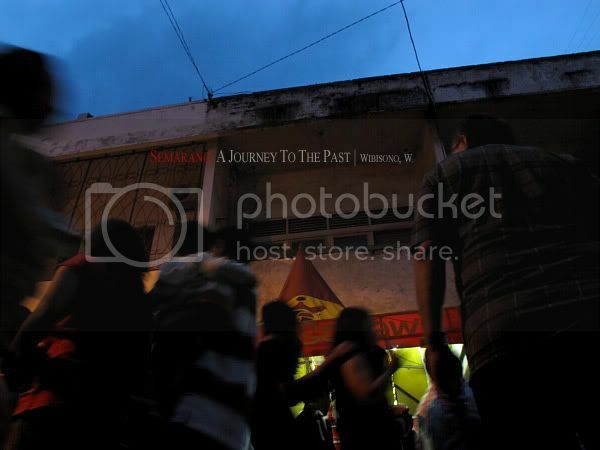 Leaving the old town for the next spot, Lawang Sewu, we took becak (three wheeled ricksaw) to reach the place. It cost us ten thousand rupiahs. 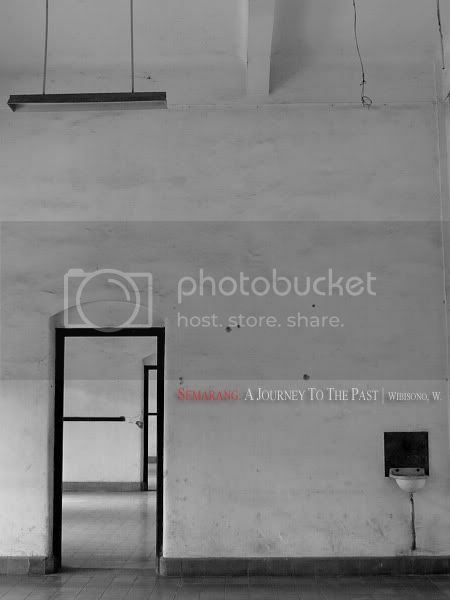 Not like in 2001 when I, for the first time, came to this place, Lawang Sewu today has become a tourism spot, run by PT KAI (Indonesian Railway Service) and is no longer spooky. We found like hundreds of people with camera visiting the place that day. I only took several shots before going to Paragon Mall for lunch. After lunch, we decided to return to our hotel for a break. I took a nap for like an hour. It was really refreshing. 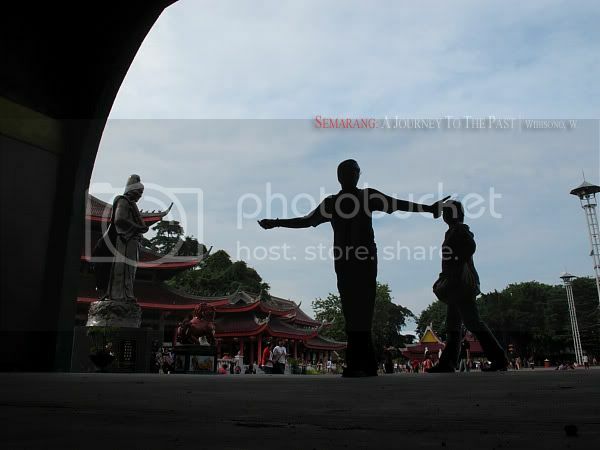 At around two o'clock, Eli and I took a taxi to Sam Poo Kong. This was my second time to go there. Nothing had significantly changed except today we had to pay Rp 30.000 to enter the temple. It was free only for those who prayed. 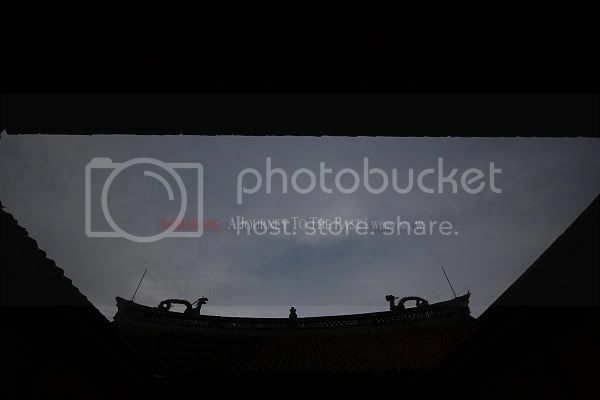 So we chose to just wander in the plaza (square) that appeared to be like the Tian An Men of Beijing that day. 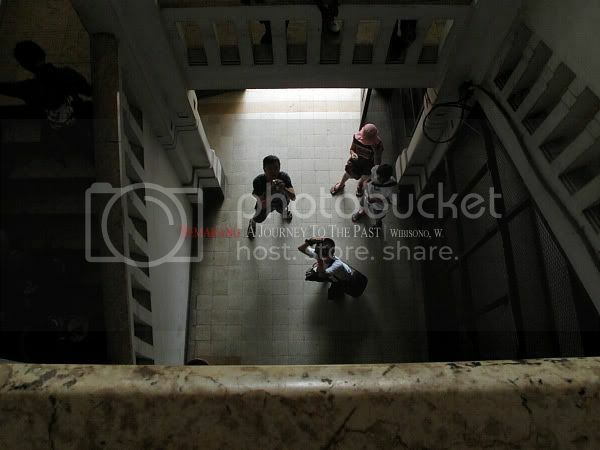 Same condition with Lawang Sewu, the square was crowded with people taking pictures. It was Chinese new year eve. We didn’t want to miss the moment of celebration at China town. 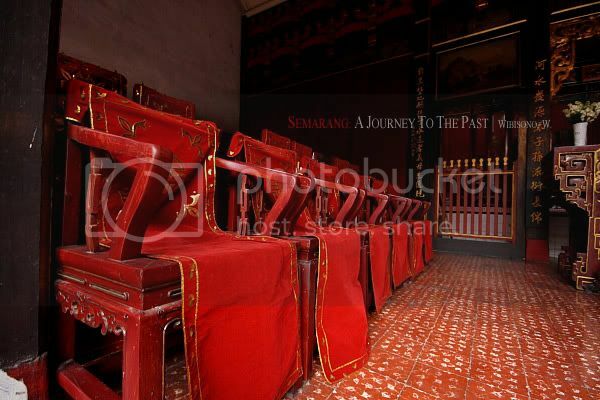 We had planned to capture it at “Klenteng Gang Lombok” as that was the only old temple that I had for so long known. We stopped a cab and directed the driver to Gang Lombok. Sadly, he had no idea where the temple exactly was. We had to walk along the narrow street of China town and ask people for a direction before finally found it. Damn! We faced similar condition with the previous two spots. Many people with cameras were coming. The worst part was the cars that were parked in front of the temple. They blocked the view to the temple. Gosh, that really ruined my plan. All images I had had in mind was kind of gone in seconds. 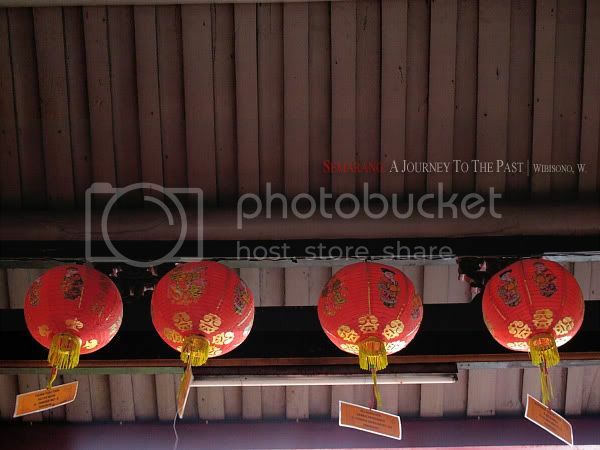 But hey, we were already in China town,and it was in Semarang. I bet there were other magnificent old temples around there. Thanks to Rachma Safitri, my friend, a traveler and an explorer, who was very helpful in giving me an advise by phone that there was an old temple called “Klenteng Hitam,” which she believed was older than the one at Gang Lombok. 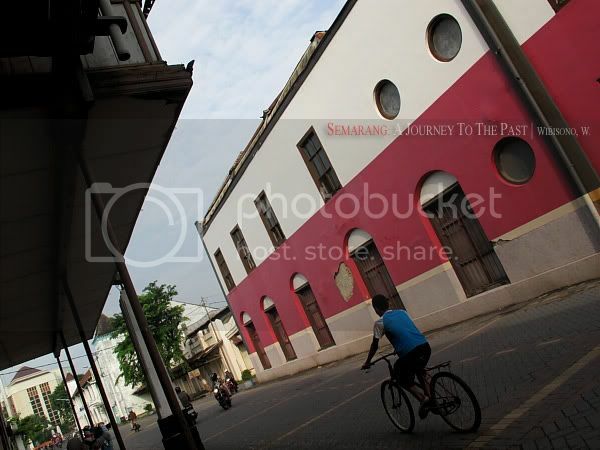 It was located on Jalan Sebandaran and could be reached on foot. Neither of us was familiar with this China town, so asking people for directions was like the only way to find the temple. After walking for nearly ten minutes, we found the street my friend had advised. It was narrow and wet. Fitri had said that there were two temples on that street. 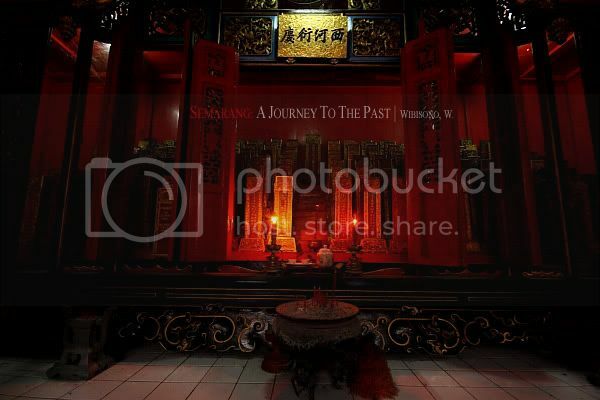 The "Klenteng Hitam" - roughly translated as black temple - was one of those. Surprisingly, no one on that street knew where the temple was. 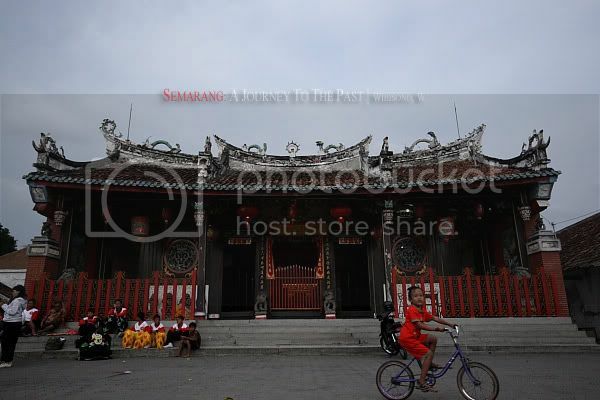 They said all Chinese temple were painted red. I thought they were joking, but they looked serious. We finally found one temple, dedicated to the family of Tan (a Chinese clan). A man came out to welcome us and said that the temple we had been searching for was the other one, and was just a few steps away from there. "So this is it. 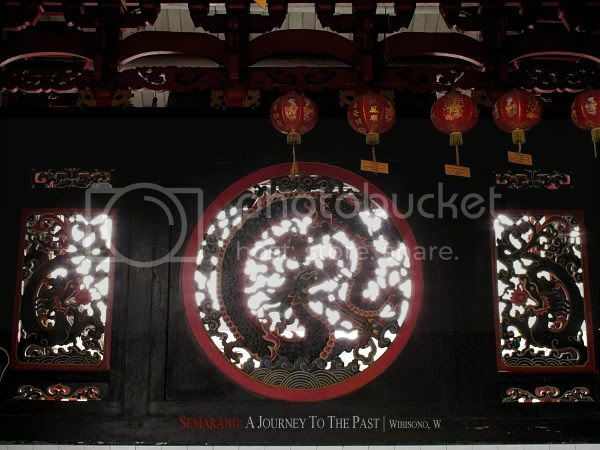 This is the temple I had seen in the movie," I told my self as we were standing in front of "Klenteng Hitam." I stepped inside and met Pak Amin, the caretaker, who was so kind and friendly he allowed me to wander in the temple that had been formally named See Hoo Kiong. This temple was dedicated to the family of Lim (a major Chinese clan in Indonesia) and housed hundreds of its urns. The oldest urn was said to be from somekind of two hundred years ago. Another centuries old thing that was preserved there was wooden chairs which were imported directly from China centuries ago. While standing in the courtyard, Pak Amin proudly told me that the temple was very well preserved, same condition as it had been centuries ago. I admired the twin dragons on the ridge and decided to capture their silhouettes as they appeared to be more alive that way. 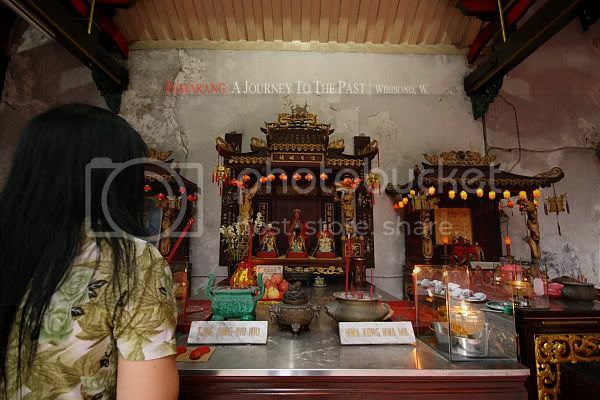 Every Chinese temple is actually a house of deity figures and sometimes ancestors that are worshipped by local Chinese. 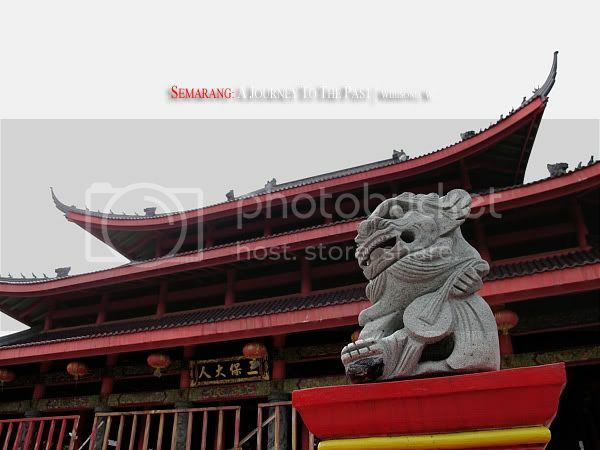 As for this temple, it was hosted by Thian Siang Seng Boo, a goddess who was believed to be the guardian and protector of fishermen. She could be a clue of what this temple had been built for. 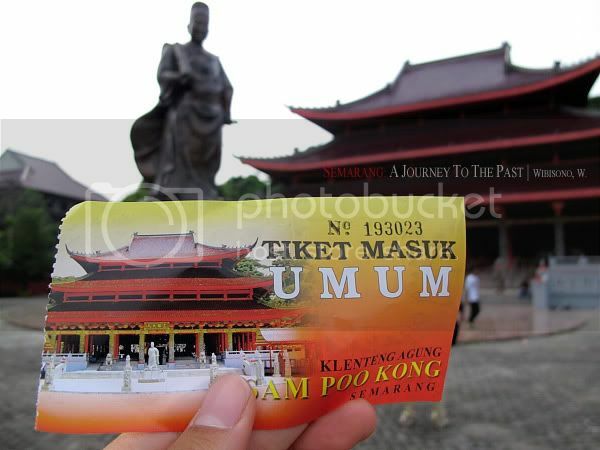 I assumed that centuries ago, it was built by Chinese fishermen who settled in the north coast of Semarang. 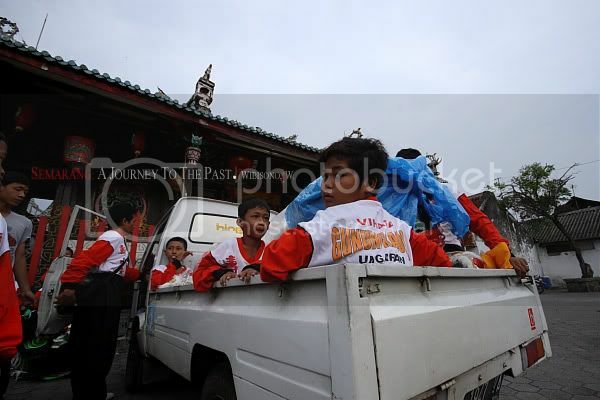 Outside the temple, a group of kids were on board, ready to leave for Marina Bay. They were going to perform in a Lion dance to celebrate Chinese new year. I couldn't help but shooting the temple over and over again. A text message from Tia was received by Eli, saying that she was already back in town and ready to join us in China town. To make it easier, we would meet at Pasar Semawis, a street food festival that was held in every weekend night. It was crowded for sure, and many foods sold were pork. 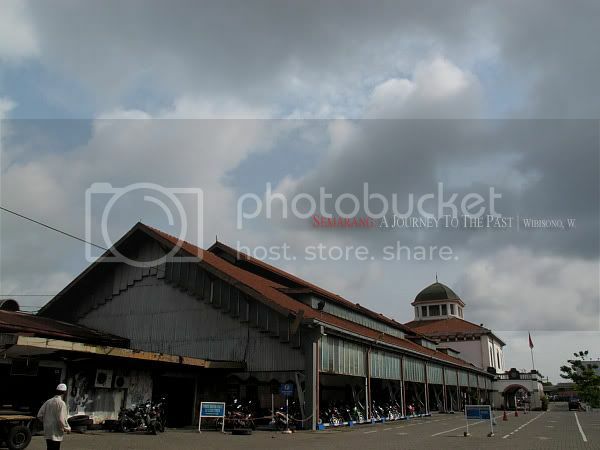 We decided to head to Simpang Lima, a big square that has become a landmark of Semarang. We rode angkot to reach the place. There were many food stalls around the square. 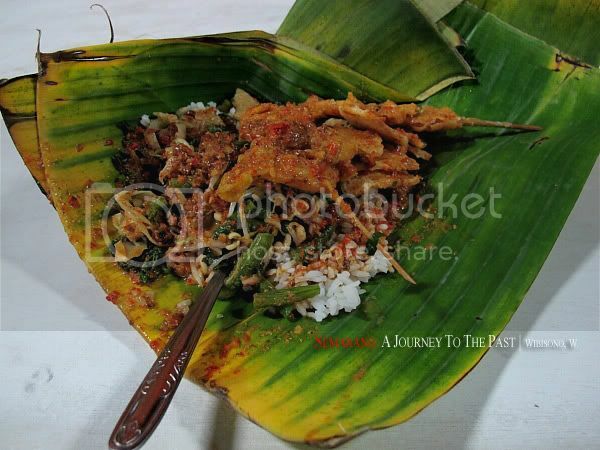 We had dinner at Pecel Yu Sri as we were curious of its 'legendary' taste that was widely published in medias. My opinion? mmm... my mom's pecel tasted better! The heavy rain suddenly poured in Semarang that night. Some people believed it was the water dragon coming down on earth. To close the night, we went to Toko Oen, which was exactly across the hotel we stayed, for its famous vintage ice cream. I didn't take pictures there as I was mad at a waiter who was being rude to us. Well, I was not going to let him ruin the trip. On the way back to the hotel, I bought loenpia, my favorite dish that could only be found in Semarang. We had to pack that night as we were going to check out from the hotel in the following morning. I was so excited with our journey that day I couldn't sleep till 1 AM while checking out my camera to see all the pictures I had taken. I guessed my friends were wrong. 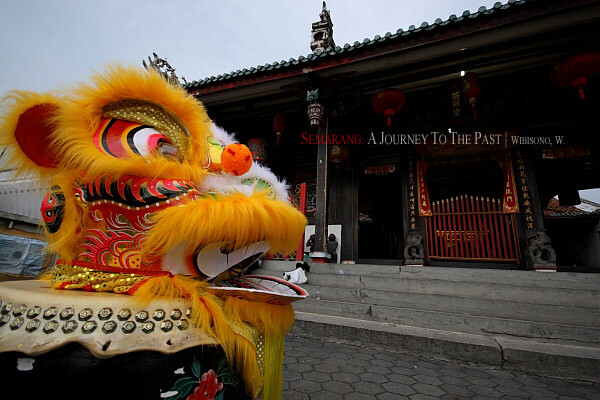 Semarang was still interesting to me and I shall return to its China town one day. Ahaha....Semarang lagi..., belum bosen2 rupanya Mas Wib! Iya, ga tau kenapa, kayanya pengen balik terus. Harus ke sana Ri. Kota lama dan Pecinannya artful. The city is already wonderful Dod... What I did was just to capture it. Thanks for coming.